Explain the phenomenon of dispersion and discuss its advantages and disadvantages. We see about six colors in a rainbow—red, orange, yellow, green, blue, and violet; sometimes indigo is listed, too. Those colors are associated with different wavelengths of light, as shown in Figure 2. 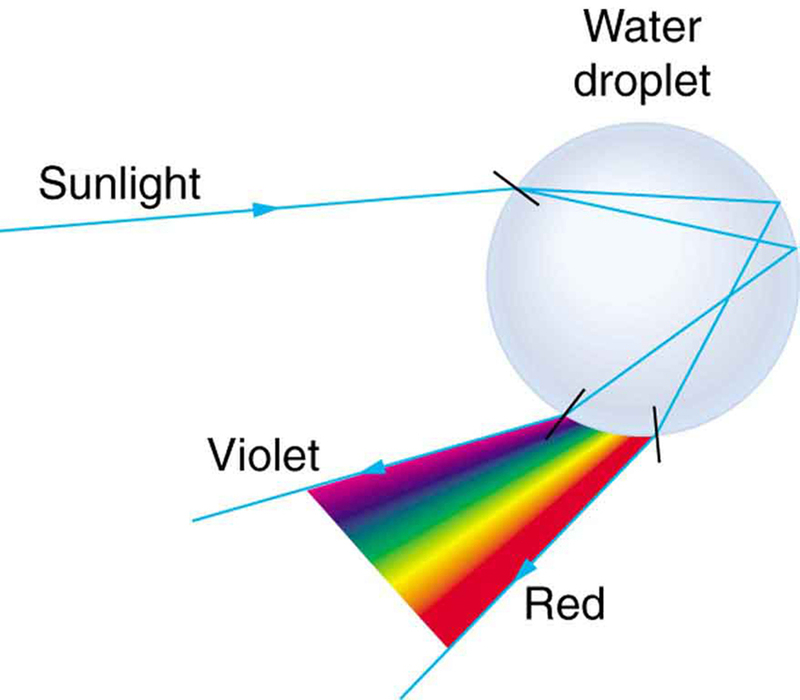 When our eye receives pure-wavelength light, we tend to see only one of the six colors, depending on wavelength. The thousands of other hues we can sense in other situations are our eye’s response to various mixtures of wavelengths. White light, in particular, is a fairly uniform mixture of all visible wavelengths. Sunlight, considered to be white, actually appears to be a bit yellow because of its mixture of wavelengths, but it does contain all visible wavelengths. The sequence of colors in rainbows is the same sequence as the colors plotted versus wavelength in Figure 2. What this implies is that white light is spread out according to wavelength in a rainbow. Dispersion is defined as the spreading of white light into its full spectrum of wavelengths. More technically, dispersion occurs whenever there is a process that changes the direction of light in a manner that depends on wavelength. Dispersion, as a general phenomenon, can occur for any type of wave and always involves wavelength-dependent processes. Dispersion is defined to be the spreading of white light into its full spectrum of wavelengths. Figure 2. Even though rainbows are associated with seven colors, the rainbow is a continuous distribution of colors according to wavelengths. Refraction is responsible for dispersion in rainbows and many other situations. The angle of refraction depends on the index of refraction, as we saw in Chapter 25.3 The Law of Refraction. We know that the index of refraction depends on the medium. But for a given medium, also depends on wavelength. (See Table 2. Note that, for a given medium, increases as wavelength decreases and is greatest for violet light. Thus violet light is bent more than red light, as shown for a prism in Figure 3(b), and the light is dispersed into the same sequence of wavelengths as seen in Figure 1 and Figure 2. Any type of wave can exhibit dispersion. Sound waves, all types of electromagnetic waves, and water waves can be dispersed according to wavelength. Dispersion occurs whenever the speed of propagation depends on wavelength, thus separating and spreading out various wavelengths. Dispersion may require special circumstances and can result in spectacular displays such as in the production of a rainbow. This is also true for sound, since all frequencies ordinarily travel at the same speed. If you listen to sound through a long tube, such as a vacuum cleaner hose, you can easily hear it is dispersed by interaction with the tube. Dispersion, in fact, can reveal a great deal about what the wave has encountered that disperses its wavelengths. The dispersion of electromagnetic radiation from outer space, for example, has revealed much about what exists between the stars—the so-called empty space. Figure 3. 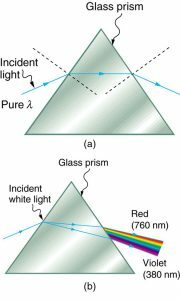 (a) A pure wavelength of light falls onto a prism and is refracted at both surfaces. (b) White light is dispersed by the prism (shown exaggerated). Since the index of refraction varies with wavelength, the angles of refraction vary with wavelength. A sequence of red to violet is produced, because the index of refraction increases steadily with decreasing wavelength. Rainbows are produced by a combination of refraction and reflection. Figure 4. Part of the light falling on this water drop enters and is reflected from the back of the drop. This light is refracted and dispersed both as it enters and as it leaves the drop. 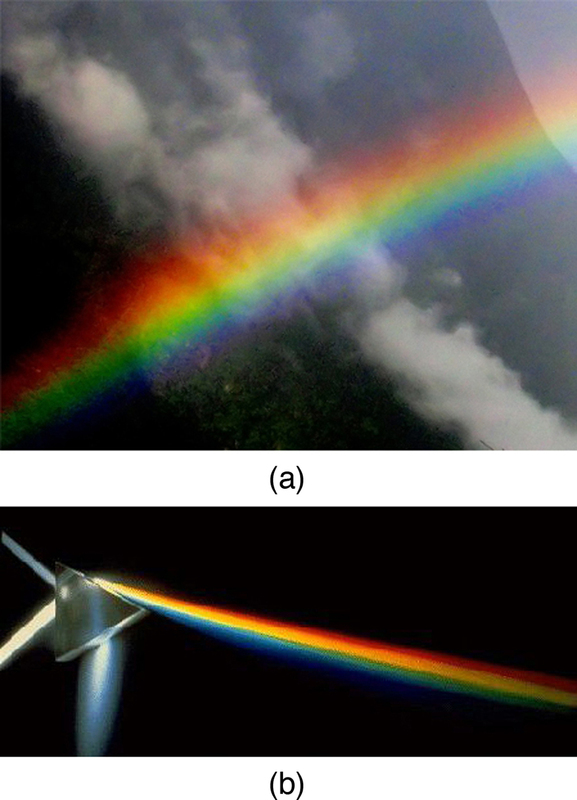 Dispersion may produce beautiful rainbows, but it can cause problems in optical systems. White light used to transmit messages in a fiber is dispersed, spreading out in time and eventually overlapping with other messages. Since a laser produces a nearly pure wavelength, its light experiences little dispersion, an advantage over white light for transmission of information. In contrast, dispersion of electromagnetic waves coming to us from outer space can be used to determine the amount of matter they pass through. As with many phenomena, dispersion can be useful or a nuisance, depending on the situation and our human goals. The spreading of white light into its full spectrum of wavelengths is called dispersion. Rainbows are produced by a combination of refraction and reflection and involve the dispersion of sunlight into a continuous distribution of colors. Dispersion produces beautiful rainbows but also causes problems in certain optical systems. 1: (a) What is the ratio of the speed of red light to violet light in diamond, based on Table 2? (b) What is this ratio in polystyrene? (c) Which is more dispersive? 2: A beam of white light goes from air into water at an incident angle of . 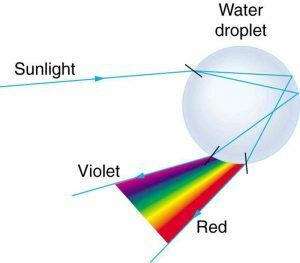 At what angles are the red (660 nm) and violet (410 nm) parts of the light refracted? 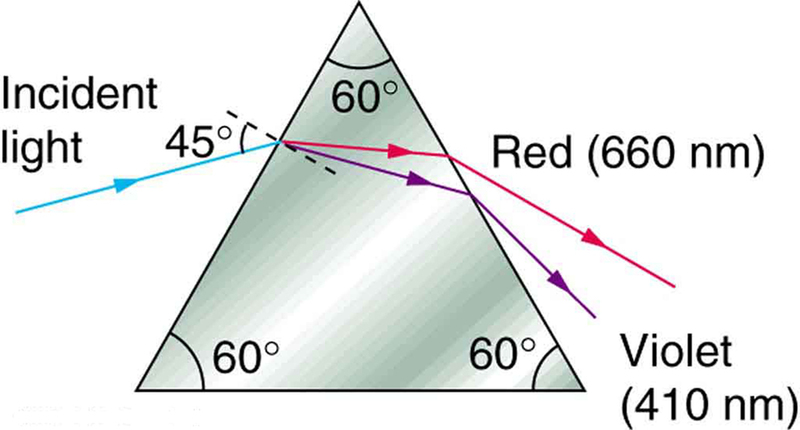 3: By how much do the critical angles for red (660 nm) and violet (410 nm) light differ in a diamond surrounded by air? 4: (a) A narrow beam of light containing yellow (580 nm) and green (550 nm) wavelengths goes from polystyrene to air, striking the surface at a incident angle. What is the angle between the colors when they emerge? (b) How far would they have to travel to be separated by 1.00 mm? 5: A parallel beam of light containing orange (610 nm) and violet (410 nm) wavelengths goes from fused quartz to water, striking the surface between them at a incident angle. What is the angle between the two colors in water? 6: A ray of 610 nm light goes from air into fused quartz at an incident angle of . At what incident angle must 470 nm light enter flint glass to have the same angle of refraction? 7: A narrow beam of light containing red (660 nm) and blue (470 nm) wavelengths travels from air through a 1.00 cm thick flat piece of crown glass and back to air again. The beam strikes at a incident angle. (a) At what angles do the two colors emerge? (b) By what distance are the red and blue separated when they emerge? 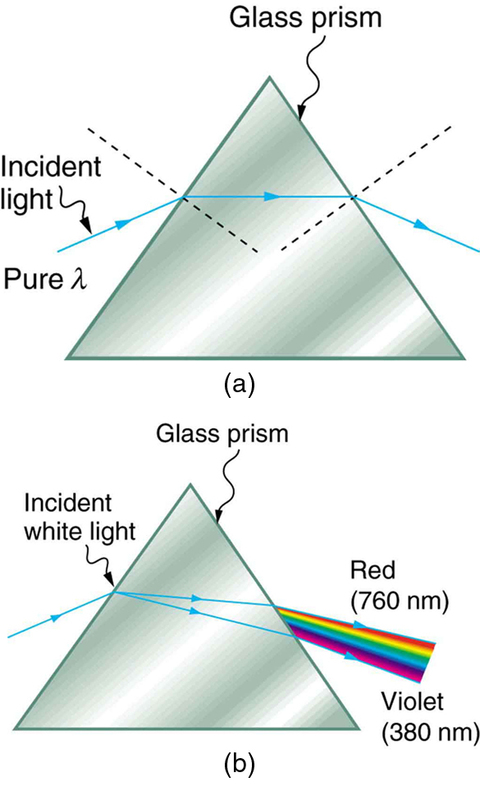 8: A narrow beam of white light enters a prism made of crown glass at a incident angle, as shown in Figure 7. 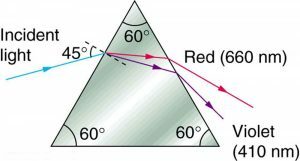 At what angles, and , do the red (660 nm) and violet (410 nm) components of the light emerge from the prism? Figure 7. This prism will disperse the white light into a rainbow of colors. The incident angle is 45.0º, and the angles at which the red and violet light emerge are θR and θV. 25.5 Dispersion: The Rainbow and Prisms by OpenStax is licensed under a Creative Commons Attribution 4.0 International License, except where otherwise noted.